Notch another victory for Alexandria Ocasio-Cortez. 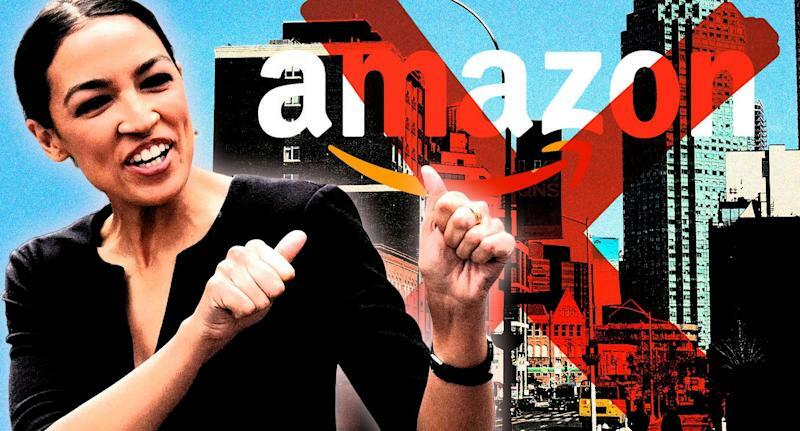 The freshman Democratic representative celebrated online retailer Amazon’s decision Thursday to scrap its plans to build a new headquarters in her New York City district. Earlier Thursday, the company announced it was reversing the plan, announced in November, to build new East Coast headquarters buildings in New York City and in Arlington, Va. The Virginia part of the plan will go ahead. The company said it would not look for a new location to replace the cancelled $2.5 billion project. "After much thought and deliberation, we’ve decided not to move forward with our plans to build a headquarters for Amazon in Long Island City, Queens,” Amazon spokeswoman Jodi Seth said in a statement. Ocasio-Cortez was one of the leaders of the fight against the proposed deal, largely over the $3 billion in tax breaks the city and state promised the company. New York’s chronic shortage of housing and the overburdened mass transit system were also cited by opponents. The deal would have meant an estimated 25,000 new jobs for the city. But as New York Times columnist Andrew Ross Sorkin pointed out after the company walked away from the city, Amazon’s gain wasn’t necessarily going to come out of New York’s coffers. Mayor Bill de Blasio, who partnered with Gov. Andrew Cuomo in hammering out the deal, issued a stinging statement over the company’s latest decision. Rep. Carolyn Maloney, who represents New York’s 12th District, where the Amazon headquarters was slated for construction, expressed her disappointment. Cuomo was also disappointed, but he took out his anger on the legislators who worked to torpedo the deal.